When will fall colors pop? EAGLE COUNTY – The weather in Colorado has been odd this year – minimal snowfall, drought, excessive heat, you name it – which is why the fall foliage season might be out of the ordinary, too. Colorado’s fall colors are some of the most vibrant anywhere. 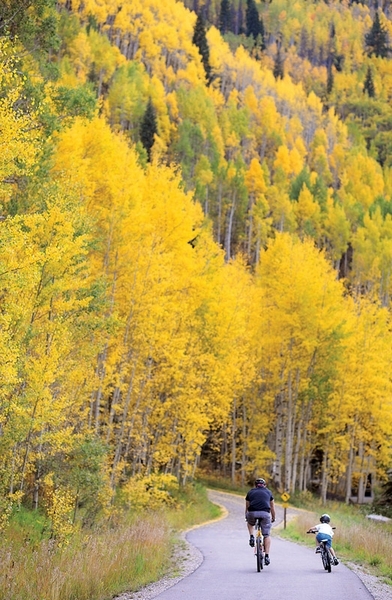 Taking a scenic drive through an aspen forest is one of the state’s big draws. But no two seasons are alike in terms of when fall colors pop and how bright the leaves become. And foresters aren’t sure how this year’s weather will affect the fall season. Aspen City Forester Chris Forman told the Associated Press that early signs of fall color could indicate trees are stressed, which could cause an early and shorter season of fall colors. A combination of light, temperature and available water causes leaves to change from green to yellow or red in the fall, according to the Colorado State University Extension. Less light on the trees because of shorter days cause trees and shrubs to enter an energy-saving mode. During a moist fall, leaves can remain bright for a longer period of time, but dry conditions cause leaves to fade to brown and drop. The Extension reports that cooler temperatures also support a longer period of color, which explains why fall colors last longer in the mountains than along the Front Range. If trees are under stress from this year’s extreme drought, however, that will also become a major factor in this year’s fall foliage.